An upper ridge remains centered over CNTRL Europe while spreading towards western Europe. An upper low deepens over western Russia. An upper trough is pushed towards S Scandinavia with an associated weakening SFC front extending south across S Sweden, E Germany towards CNTRL France. A MDT risk has been issued for E-CNTRL Germany, NW Czech Republic and NW Poland with threat for large to very large hail, severe winds and torrential rainfall. Large clusters currently over Germany are expected to increase in coverage and intensity and spread NE across the risk area. Additional storms, including some discrete supercells, are likely along the old outflow boundaries and local topographic features before merging into one or two MCSes in the evening hours. A SLGT risk has been issued for areas surrounding the MDT risk where more isolated severe storms are expected, risk has also been extended into CNTRL France. Large hail, severe winds and heavy rainfall are the main threats. 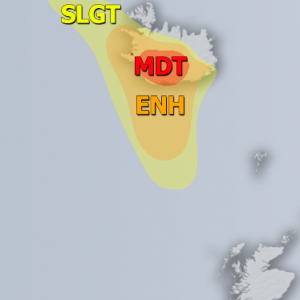 A SLGT risk has been issued for parts of SW Norway and central Sweden with threat for large hail, severe winds and heavy rain. A SLGT risk has been issued for parts of E-CNTRL Balkans with threat for large hail, severe winds and heavy excessive rainfall given the slow moving storms. TSTM+ areas have been placed over E Turkey, Georgia and SW Russia where some strong to severe storms are still possible, but lack of stronger shear limits more robust storms.